Never hunt around for another crystal again, with the Si5351 clock generator breakout from Adafruit! This chip has a precision 25MHz crystal reference and internal PLL and dividers so it can generate just about any frequency, from <8KHz up to 150+ MHz. The Si5351 clock generator is an I2C controller clock generator. It uses the onboard precision clock to drive multiple PLL's and clock dividers using I2C instructions. By setting up the PLL and dividers you can create precise and arbitrary frequencies. There are three independent outputs, and each one can have a different frequency. Outputs are 3Vpp, either through a breadboard-friendly header or, for RF work, an optional SMA connector. The clock generator on the breakout requires 3V power. Since many customers have 5V microcontrollers like Arduino, we tossed a 3.3V regulator on the board. Its ultra-low dropout so you can power it from 3.3V-5V just fine. 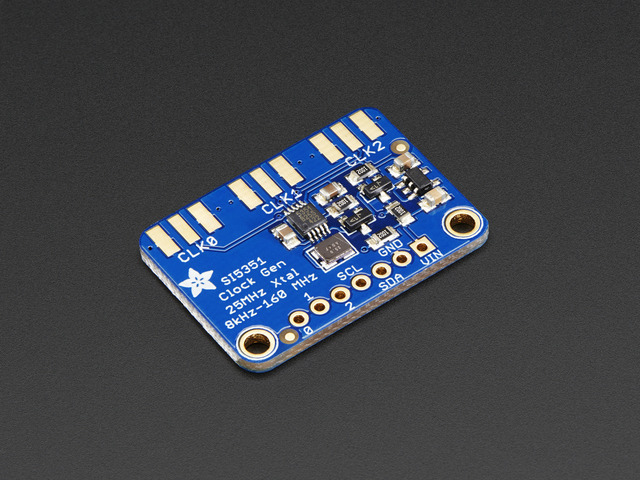 SCL - I2C clock pin, connect to your microcontrollers I2C clock line. This pin is level shifted so you can use 3-5V logic, and there's a 10K pullup on this pin. SDA - I2C data pin, connect to your microcontrollers I2C data line. This pin is level shifted so you can use 3-5V logic, and there's a 10K pullup on this pin. 0, 1, and 2 - These are the 3 independent clock generated outputs. They are square waves, from 0-3V. The clock out pins are also brought out to SMA edge-launch connectors on the other side of the PCB. 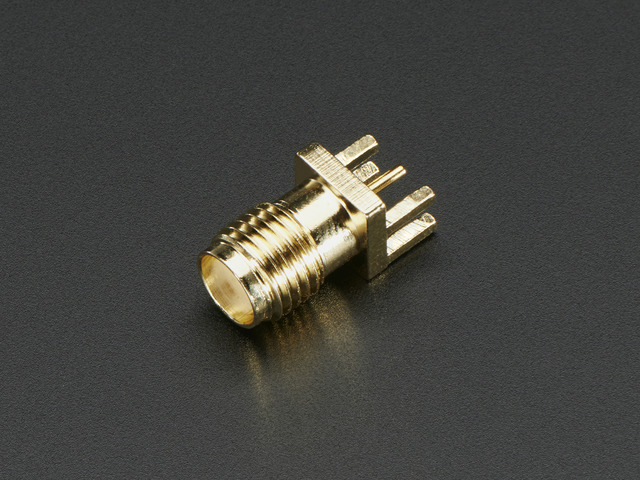 You can purchase and solder on some edge-launch SMA connectors if you want to pipe the signal into an RF cable. This guide was first published on Aug 12, 2014. It was last updated on Aug 12, 2014.